Mr. Peach with his "mom," DVM Class of 2018 member Suzanne Wasserman, who brought him to the Veterinary Teaching Hospital on his two-year "Surgiversary" for a follow-up procedure. 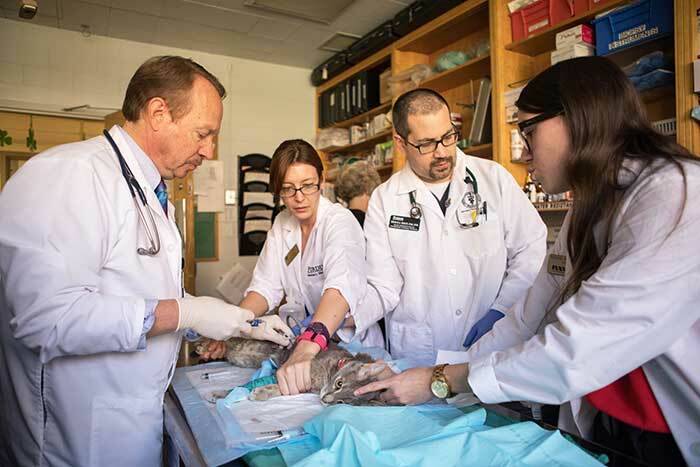 A well-loved eight-year-old feline patient of Purdue Veterinary Medicine's Veterinary Teaching Hospital, Mr. Peach, returned to Lynn Hall recently for a follow-up procedure on the occasion of his two-year "Surgiversary," a term coined by his "mom," Suzanne Wasserman of the DVM Class of 2018. "Mr. Peach has been treated with so much care and love at the hospital," Suzanne said. "I always joke around that he's a celebrity since everyone knows him. I'm hoping that now that I'm a clinical [fourth-] year student, doing rotations in the hospital, people will refer to me as Suzanne and not 'Mr. Peach's mom'... not that I mind that title." Regardless of how she is referred to, everyone agrees that Suzanne is a wonderful companion and caregiver for Mr. Peach, whose case dates back to February 2015, when he had to undergo emergency surgery. He initially was seen by Dr. Steve Thompson, clinical associate professor of small animal community practice, after Suzanne noticed her cat was suffering from weight loss, vomiting, and lethargy. His bloodwork showed that his kidneys were not functioning as they should and radiographs provided evidence of bilateral kidney stones. 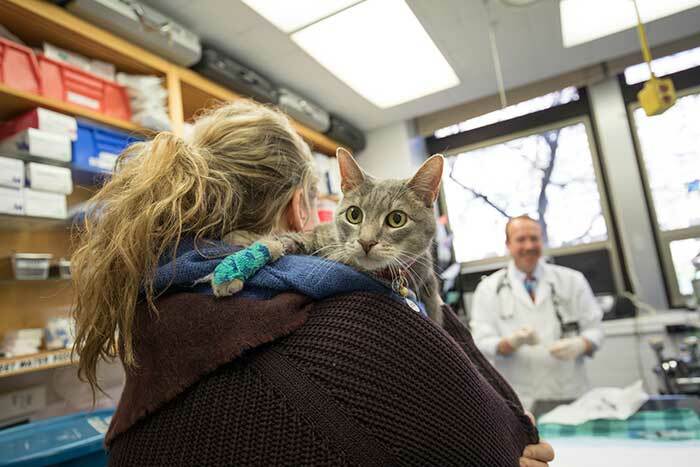 Mr. Peach then was transferred to the Veterinary Teaching Hospital's (VTH) Small Animal Internal Medicine service to be seen by Dr. Larry Adams, professor of small animal internal medicine. Immediate surgery was recommended on February 27, 2015, to have bilateral subcutaneous ureteral bypass (SUB) systems placed by small animal surgery resident Marine Traverson and Dr. Adams. "I was initially very overwhelmed," Suzanne recalled. "Mr. Peach didn't seem that sick so it was a shock to learn exactly how critical his condition was. I sometimes tease Dr. Adams that he jinxed me since we had JUST learned about SUBS in first-year physiology and then Mr. Peach became ill."
Dr. Larry Adams, professor of small animal internal medicine, and his Small Animal Internal Medicine team, including clinical year student Rachel Wirgau, resident Ewan Wolff, and fourth-year veterinary student Natalia Hernandez Diaz, perform a bilateral subcutaneous ureteral bypass (SUB) flush during a follow-up appointment for Mr. Peach. During the emergency procedure, a SUB system was surgically placed between each kidney and the bladder, essentially acting as an artificial ureter enabling urine and waste products from Mr. Peach's blood to be eliminated from his body. There is a port on each side that allows access to the system, which is situated just under his skin. A Huber needle can be inserted into the port, making it possible for it to be flushed and to sample the urine. Julie Commons, RVT, VTS, small animal internal medicine veterinary technologist, said Mr. Peach has done wonderfully ever since, coming to Lynn Hall for follow-up visits with Dr. Adams every three months. When Mr. Peach reached his two-year "Surgiversary," he returned for a SUB flush. "I don't know what I would do without Dr. Adams and Julie Commons," Suzanne explained. "They always work with my busy school schedule and are constantly brainstorming ways to make Mr. Peach happier and healthier. The follow-up appointments can sometimes be stressful and they do an amazing job of making sure Mr. Peach is as relaxed and comfortable as possible. Julie even takes the time to cuddle him if he has to hang out while I'm in class. I couldn't ask for a more caring team to take care of him." Suzanne's experience bringing her cat to the VTH as a patient also has given her a new perspective on the client experience. "Being a client has really helped me to learn to empathize," Suzanne said. "Even with my veterinary training and understanding, when your pet is sick all logic goes out the window and it can be difficult to think clearly. The staff has always been great about explaining things and making sure I understand and know what is going on with Mr. Peach. I hope to do the same for my clients as I rotate through the hospital this year." With the excellent treatment and compassion provided by the VTH and the loving care from "mom," it certainly was an appropriate occasion for saying "Happy Surgiversary!" Congratulations to Mr. Peach, Suzanne and the Small Animal Internal Medicine service! This story is part of the 2017 Spring PVM Report.